America’s 60 national parks are filled with treasures that often rival those around the world. Right in our own backyards, union families can experience wonders from glaciers to coral reefs. With so many to choose from, we picked our favorite features and found that “Made-in-America” has never looked so stunning! North America was once covered in glaciers. The last of America’s glaciers are mostly in Alaska at Denali, Lake Clark, Glacier Bay, Kenai Fjords and Wrangell-Saint Elias national parks. And, perhaps surprisingly, also in Glacier National Park, Montana and Mount Rainier, Washington. King’s Canyon, Redwood and Sequoia national parks, California all have giant sequoia and redwood trees including some of the largest trees recorded. Joshua Tree, California is a desert landscape populated by vast stands of Joshua trees. 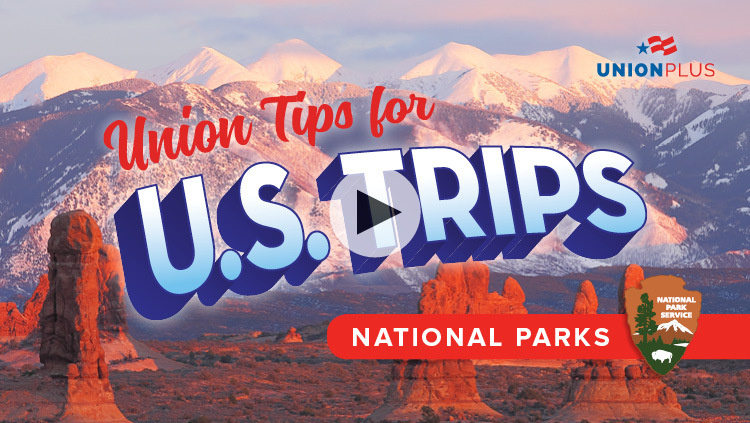 Find impressive natural sandstone arches, spires, mesas and other rock formations at Arches, Bryce Canyon, Canyonlands, Capitol Reef and Zion national parks in Utah. Yellowstone, Wyoming is home to its own 24-mile long Grand Canyon. Grand Canyon, Arizona — the 277 mile-long canyon is the second most visited national park in the U.S. and is often listed as one of the Wonders of the World. Yellowstone which sits in three states — Wyoming, Montana, and Idaho — has about 10,000 geysers, hot springs, bubbling mud pots, and hot spring terraces. Hot Springs, Arkansas has 47 hot springs that provide the famous Bathhouse Row with therapeutic waters. Death Valley, which sits in both California & Nevada, is the hottest, lowest, and driest place in the U.S. It’s so infamous that almost 100 movies and TV shows have featured Death Valley. Great Sand Dunes, Colorado boasts the tallest sand dunes in North America. Crater Lake, Oregon — home to the deepest lake in the U.S., a magnificent blue lake within an ancient volcano. Isle Royale, Michigan — the largest island in Lake Superior. Voyageurs, Minnesota — home to four major lakes well-known for canoeing, kayaking, and fishing. Discounts on dining, theme parks, sightseeing, events and more.